ARM, the company that styles the processor architectures utilized in virtually all mobile devices on the market, has used Computex Taipei 2016 to announce new product that it expects to visualize deployed in high-end phones next year. The Cortex-A73 CPU and Mali-G71 GPU are designed to extend performance and power efficiency, with a specific view to supporting mobile VR. ARM says that its mali line of GPUs are the most wide utilized in the globe, with over 750 million shipped in 2015. The new Mali-G71 is that the first to use the company’s third-generation design, called Bifrost. The core permits for 50 p.c higher graphics performance, 20 p.c higher power potency, and 40 p.c a lot of performance per square millimetre over ARM’s previous mali GPU. 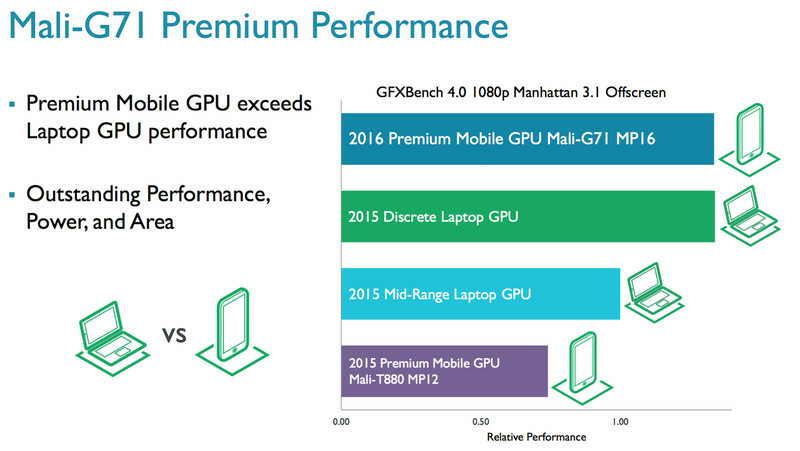 With scaling up to 32 shader cores, ARM says the Mali-G71 can match separate laptop GPUs like Nvidia’s GTX 940M. it is also been designed around the specific issues thrown up by VR, supporting features like 4K resolution, a 120Hz refresh rate, and 4ms graphics pipeline latency. As for CPUs, ARM is announcing the new Cortex-A73 core, which prioritizes power efficiency. It’s up to 30 percent more efficient than the previous Cortex-A72 while offering about 1.3 times the level of peak performance, but ARM has also focused on sustained usage — the A73 offers over twice the performance within its power budget, meaning it doesn’t need to be as hasty to slow down to save battery life. Although ARM architecture dominates the mobile landscape, there’s a good chance you won’t see these specific products in your 2017 flagship phone. ARM licenses its architecture and cores separately, meaning companies are free to pick and choose what they like. Apple, for example, licenses ARM architecture but now designs its own custom CPU cores (known as Twister in the most recent A9 processor) and uses PowerVR GPU solutions from Imagination Technologies. Samsung, meanwhile, designs some Exynos processor cores but uses them alongside ARM’s Cortex cores and Mali GPU in the international Galaxy S7. And Qualcomm reverted to its own custom Kryo CPU cores in the Snapdragon 820 — which powers the US Galaxy S7 — after using Cortex in the 810. ARM premium CPU: ARM Cortex-A73! All of this is to say that you shouldn’t take the performance laid out here by ARM as a benchmark for your next phone, because it’ll all depend on how the manufacturers choose to implement the technology. But the new Cortex and Mali products do demonstrate that mobile technology continues to advance in terms of power and efficiency, and that it’s adapting to new challenges such as VR. ARM expects chips to move into production at the end of the year and appear in shipping devices in early 2017.